My husband is cooking dinner. That's right. The man is standing at a cutting board chopping ears of corn in half so that they will fit in our smallish pot of water (we don't own a big one). Pork chops are searing on the stove and will soon be whisked into the oven to bake. I caught a glimps of some kind of bread crumb coating on the chops as they sizzled on the stove, but I didn't dare go closer. 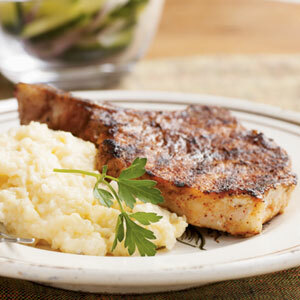 Until tonight, I didn't realize that pork chops could be dipped in bread crumbs and seared. Sad, right? What I should explain is that I'm not dumb, I just haven't really spent any quality time considering the many possible methods by which I might prepare pork chops. Or steaks. Or chicken breasts. Or anything for that matter. While I do love food (especially white corn on the cob in the summer time! ), I've always left the finished product of a MEAL in the realm of MAGIC. For instance, I don't know how computers work, or how an electron spins around the nucleus of an atom, or how a car battery re-charges itself even as it's being used. But I do take full advantage of utilizing computers, driving my car and... well... existing as matter. "Do you even like pork?" he asks me now, his mouth full of bacon which we cooked up last night. It's a moot point now, I suppose. But he appears relieved when I answer yes. "Ben would think it's so funny if I did all this and then you didn't like pork." Ben. The buddy who cooked for Jon and other assorted childhood friends and college pals this past weekend in Columbus, Ohio. The boys got together to celebrate a bachelor-style break from the wives in the midwest. And when Jon returned yesterday, he was tired, bearded and ready to do some cooking. Apparently Ben held forth about the merits of home cooking, both its levels of deliciousness and its economy, for three straight days. He even made butter in an electronic mixer. It was all I could do to stop Jonathan from grabbing buttermilk from the shelf at the grocery store last night, dragging him away from that aisle even in the face of his insistance, "It's fun! Easy! Cool!" Later on he remembered that it wasn't buttermilk but heavy whipping cream which can be mixed into homemade butter. I consoled him by reminding him that buying butter is easier and cooler and more fun. So, tonight, Jonathan is cooking dinner. He didn't don an apron. though that definitely would have been blog-worthy. He didn't whistle over the pot of boiling water. He didn't shoo me out of the kitchen (entirely) while he finished up the meal, but he did run from appliance to appliance with a very domestic, very man-of-the-house-master-of-his-domain look on his handsome (now clean-shaven) face. If he can do it, I can do it. But if he does it, why should I? Besides, one of us has to be the blogger... and that's a tall order! Tonight's meal smells delicious, and I can't wait to savor every porky, corny bite of it. In the meantime, I think I'll run and give my sweetheart a kiss.